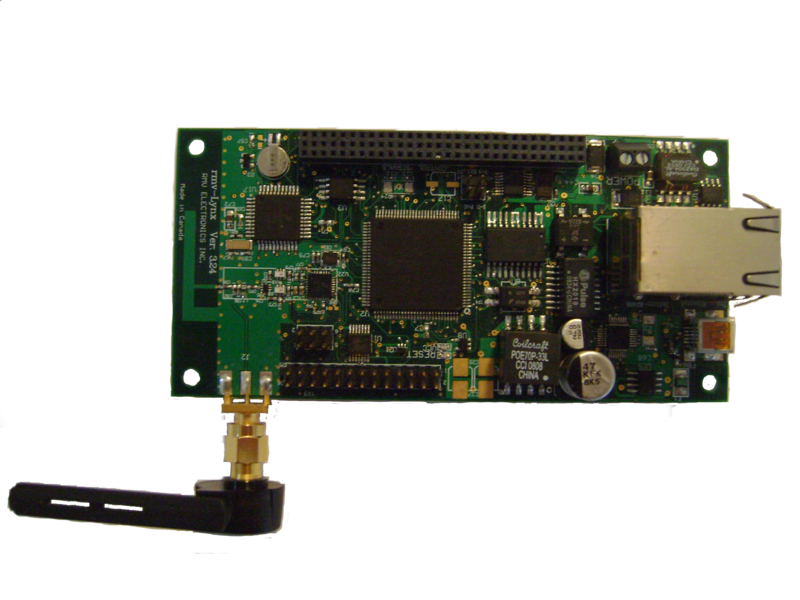 The rmv_Tasker Module delivers the foundation required for building modular and reliable motor control applications, its motion kernel is tightly integrated with a TCP/IP stack and device drivers for various motor topologies . All motor low level functions has been developed for ST600µNET stepper motor controller. rmv_Tasker kernel also has incorporated a scripting interpreter for executing standalone programs from 32Mbytes of Flash EPROM or/and SD Card. In Addition, rmv_Tasker will allow to interface ST600µNET with several industrial protocols like: Modbus, CC-link, EtherCAT trough a series of wrappers in order to optimize motion tasks in real time. Also rmv_Tasker has already embedded the following capabilities: digital tachometer, analog input, digital input-output from:5V to 24V, period measurement, timers: global, one shoot, periodic programmable. The following picture shows a HTML Page ( Menu) how the FileSystem can configure the ST600µNET which link-protocols it will be used. Setting Security ID, Setting IP Address, Setting RS485 Link, Loading Stand alone program, and all configuration needed to create a truly IoT Motion Control Application. The rmv_Tasker MODBUS module is a ‘drop-in’ protocol module which enables devices to be integrated into a MODBUS environment in a simple but very flexible manor. It allows operation as a serial slave device (RTU or ASCII), a TCP slave device, a TCP gateway to serial (RTU or ASCII), a TCP master or serial master (RTU or ASCII), and a mixture of these types to multiple TCP ports and/or multiple serial interfaces as desired. MODBUS module will allow to control four axis per address any topology of electrical motors. Specially registers has been defined which can be re-programmable in the field in order to interface with any system already installed. Discrete Binary Inputs: The following read only signals are: Isolated Inputs ,Non-isolated Input, Motor Switch Limits : right-left-home, Emergency Stop, External Trigger. Coils:The following signals are included in this category: Isolated Outputs, Motor Triggers, Motor Stop, Motor Attention, External Pulse Counter, Timer Input Captures. Input Registers:16 bit read only registers.The following signals are included in this category: Analog Inputs , Motor Status Flags, Chopper Driver Status, Motor Event Flags, Program Status Execution, FIFO Status, Error. Holding Registers:16 bit registers.The following signals are included in this category: FIFO Write-Read, Program Write-Read, Motor Control RAM, Motor Setting Parameters, Graphics Interface, and Program Counter. The grouping of the access types is quite flexible and it is also possible to overlap them so that, for example, the holding registers (R/W) could also be accessed (read) via the input registers (R). The following diagram shows a MODBUS serial slave device with various inputs and outputs which can be grouped into the MODBUS access types. The first TCP port is defined to listen on the standard MODBUS port 502. The second is a user defined port 4321. 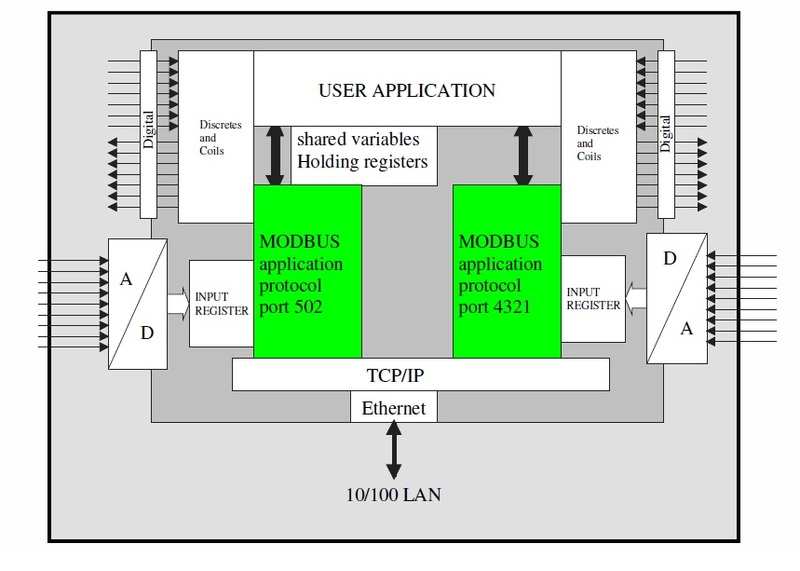 The actual number of TCP ports which are foreseen is defined by MODBUS_TCP_SERVERS in Modbus.Html. For each TCP slave there should be a corresponding entry in the parameter configuration table. The example is using the same set of MODBUS data tables but more likely two different sets would be used for the two port access points. . The number of socket sessions for each port is defined Modbus.Html. For example: MODBUS_SOCKETS_0 = 5 , ( number of sessions for first ); MODBUS_SOCKETS_1 3 =3 (number of sessions for second ). 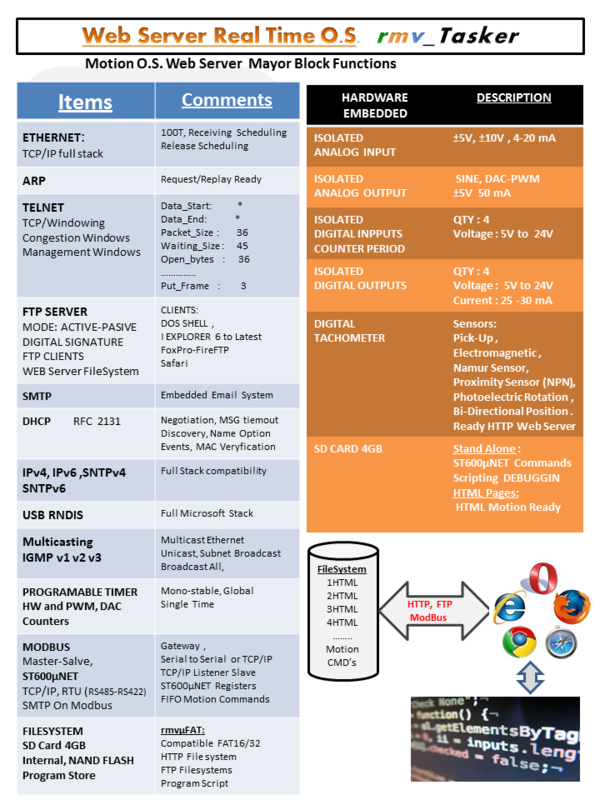 The MODBUS TCP slave port 2 (the first TCP slave) can thus have simultaneous Connections from 5 different TCP masters on its TCP port. The MODBUS TCP slave port 3 (the second TCP slave) supports up to 3. 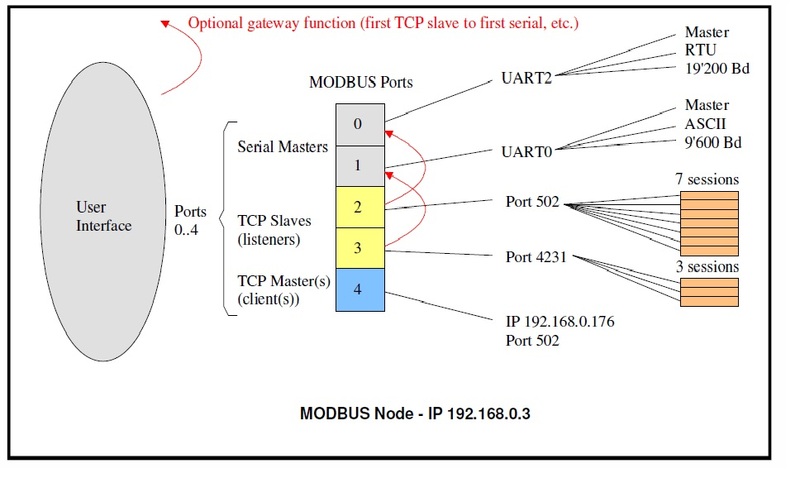 The following diagram shows a MODBUS TCP slave with two ports addresses, each with its own set of independent data.